Parasites are creatures that get their nourishment from other creatures. Parasites that live off rabbits are mites, fleas, ticks and mosquitoes. Some of these parasites can also carry infectious diseases such as Myxomatosis in their mouth parts. Please ensure that any products you use to treat parasites are safe for rabbits – not all of them are. Mites are minute creatures that live in rabbits’ fur. They feed on skin and fur cells and set up irritation on the skin. They can also be found in the ears. The most common kind we see on rabbits skin are called Cheyletiella. Your rabbit may or may not seem itchy. There will be dandruff in the fur. If some of the dandruff is put under a microscope it will be possible to see that it’s moving, because in fact the dandruff is made up of dead cells and the mites themselves. They’re like miniature spiders and in fact belong to the same family as spiders. Rabbits carry some mites in their fur all the time, but sometimes the numbers will get out of control and then owners need to treat the infection, otherwise their rabbit will become very weak. If your rabbit gets a mite infestation keep an eye on its general health. It may have an underlying illness that is preventing its immune system from keeping the mites under control. Treatment is straightforward. It can be via a spot-on liquid onto the rabbit’s skin. This needs to cover a wide area of the skin and to be repeated a few weeks after the first treatment. Be careful which preparation you use. 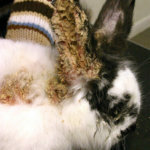 Do not use products for other pets as some (eg Frontlne) are very dangerous for rabbits, and will kill them. Your vet will be able to tell you which product is safe to use. Alternatively, your vet can give your rabbit injections that will kill the mites without needing to use any spot-on products. Fleas live on blood. They generally don’t stay on he body for very long. They will jump on to the host, bite through the skin to get some blood and then jump off again. They don’t breed on their host, but will lay their eggs, for example, in your furniture or carpets, or in the corners of hutches, only coming back to the host when they need more blood. When treating for fleas, the environment needs to be treated too. The same drugs that kill mites will also kill fleas, but you must also remove your rabbit from its normal environment, change all bedding, clean everything thoroughly and apply an environmental treatment that will kill any fleas or their eggs. Once all fumes have cleared, you can return your rabbit to its home. All your pets should be treated at the same time. Ticks are also blood suckers. If you have dogs, they can bring ticks home after they have exercised. They will drop off their host once they have had a full meal of blood and hide until they need more, then they’ll hook their mouth parts into a new host, which might be any of your pets, or any member of your family. If you find a tick on your rabbit, you should contact your vet to identify the correct preparation to kill it. Don’t just pull it off while it’s feeding. If some of the mouth parts break off in the skin they can allow infection in, leading to possible abscesses. 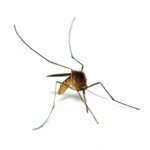 Mosquitoes are the most difficult to deal with because they are in the environment, especially in warm, damp weather. They can breed in surprisingly small pockets of water. They drink the blood of their host, and are believed to be one of the major causes of the spread of Myxomatosis. If you have standing water in your garden, even in plantpot drip trays, pour it out to deprive mosquitoes of a place to breed. If there’s water you can’t remove, such as a wildlife pond, put a small amount of washing up liquid into the water. It won’t hurt any fish, frogs, snails, etc in the pond, but will form a thin film over the surface of the water, depriving mosquito larvae of oxygen and killing them.